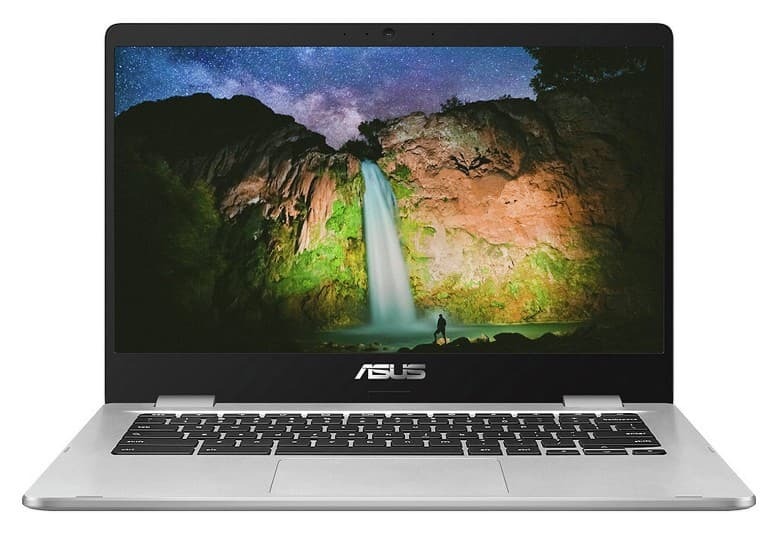 Asus has been making Chromebooks for many years, so it’s fair to say they know what they are doing. The experience Asus has is clear to see with the Asus C423. It’s an excellent budget laptop and is capable of running Android Apps. Chromebooks have become more and more popular over the years, so the choice when choosing a Chromebook is huge compared to what was available when they first launched. Let’s take a look at the Asus C423 to see if this should be your next Chromebook purchase. This is a great budget Chromebook that comes with Android Apps capability. You'll find it hard to find another Chromebook at this price that offers so much. It looks great and comes with enough RAM and storage for most users. The Type-C connectivity is also great to see on a Chromebook at this price. 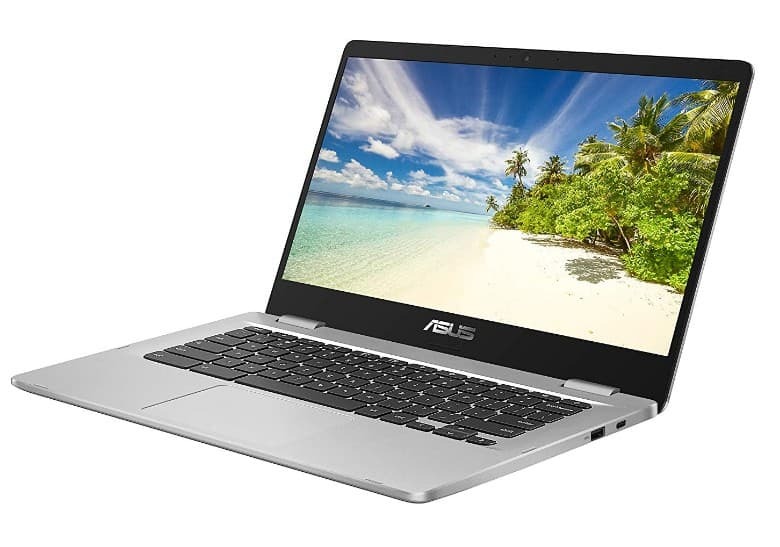 The Asus C423 is an impressive looking laptop and this is thanks to its ultra-slim design. The aluminium finished lid in a subtle grey makes it one of the sexiest looking Chromebooks around. You’ll definitely not be embarrassed to get this Chromebook out on your journey to work. The Great thing about the Asus C423 is the display, which takes up all the available space available. This is thanks to the NanoEdge design. A Chromebook with huge borders around the display never look that great, so it’s good to see the Asus C423 does not disappoint in this area. The processor that comes with the Asus C423 is an Intel Celeron N3350. It’s a dual-core processor capable of 1.1GHz with a turbo boost of up to 2.4GHz. It also comes with 2MB of cache, which is used to speed up the processor on tasks you carry out regularly. This is the most common type of processor that you’ll find on budget Chromebooks. It’s more than capable of dealing with day to day tasks such as internet surfing and streaming videos. The processor will also be able to cope with running most of the Android Apps available through the Play Store without any problems. You may notice a delay if using the Chromebook for multi-tasking, but this should not be too noticeable. 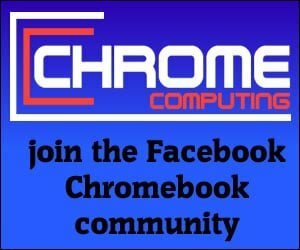 The Asus C423 may not be the right Chromebook if you’re buying a Chromebook to take advantage of Linux Apps, which will be available in the future. If you’re looking for a Chromebook capable of running Linux Apps then a budget Chromebook is not the right choice. The Asus C423 comes with 4GB of RAM, which is great to see on a budget Chromebook. At the moment 4GB of RAM is more than enough to do most things. It will easily deal with day to day tasks and you should have no problems using any of the Android Apps currently available from the play store. A Chromebook with 2GB of RAM can still run comfortably for internet surfing and streaming videos. The added memory will make these tasks run much quicker with the 4GB of RAM available on the Asus C423. The storage that comes with the Asus C423 is more than enough for most users. The 32GB of internal storage will mean you’ll have a lot of space to store files that you’re working on. When you consider some budget Chromebooks comes with 16GB of storage you’ll have no problem with the 32GB of storage you get with the Asus C423. Chromebooks traditionally did not need much storage space because you would save your work in the cloud. To find out more about cloud storage have a read of what is Google Drive and why it’s perfect for the Chromebook. This article goes into great detail about cloud storage and the cloud storage service provided by Google. Since the launch of Android Apps, the amount of storage your Chromebook has is important. This is because Android Apps are installed on your internal storage. The 32GB of storage available on the Asus C423 means you’ll have no problem installing a lot of Android Apps. It’s unlikely you would find a budget Chromebook offering more storage space than this, so the Asus C423 definitely delivers on storage. Thanks to the NanoEdge design the display on the Asus C423 uses all the available space. This means you get an impressive 78% screen-to-body ratio. This also makes the Asus C423 look good, as the display takes up most of the space. This stops you getting a huge border around the display, which can make a laptop look cheap. The Asus C423 comes with a 14-inch display and a resolution of 1,366 x 768. It would have been nice to see a 1,080 resolution display here, but when you consider the price of the Asus C423 it’s not too much of an issue. However, it lacks IPS, which makes viewing at an angle difficult. It also features a matte anti-glare coating, which means you’ll not have any annoying reflections when using your Chromebook. This is great to see because in certain situations a reflection can make it difficult to use your Chromebook. 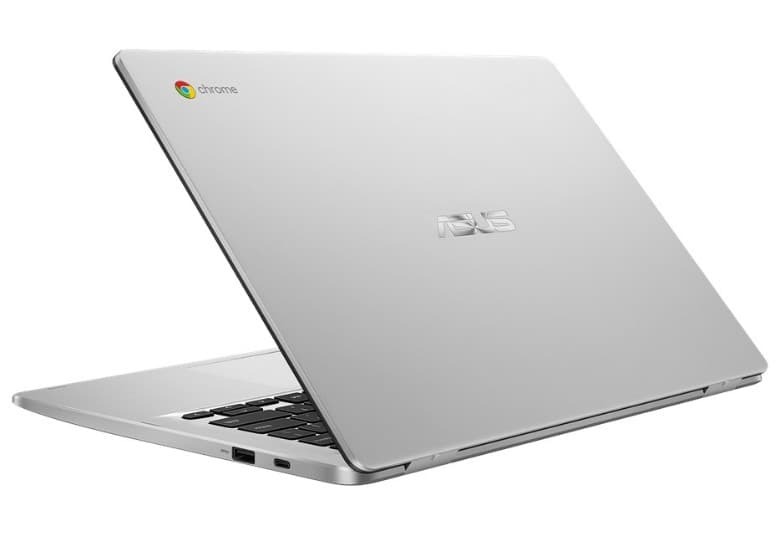 The Asus C423 also comes with a durable 180 degrees hinge, which means the Chromebook can be laid out flat. This is great if you need to share what is on the screen with your friends or work colleagues. One of the great benefits of a Chromebook computer is the battery life. The Asus C423 does not disappoint in this area. It provides up to 10 hours of usage on a single charge, which means you’ll easily be able to use your Chromebook all day without any problems. This is where the Asus C423 offers bags of connectivity. Not only does it offer 2 x USB 3.1 ports. It also comes with 2 x USB type-c ports. This is great to see on a budget Chromebook as type-c is the future connectivity that all computers will eventually have. Type-c provides super fast data speeds, which means you can transfer 2GB of data in under two seconds. It also means you can use the type-c ports to charge your Chromebook. The good thing about type-c is that you can insert the lead either way, so there are no more annoying problems trying to make sure the USB port is faced the right way. It also comes with a MicroSD slot, which means you can add extra storage to your Chromebook should you run out of memory. However, the 32GB of storage available on the Asus C423 may mean you never need to add any additional storage. If you’re after a great looking Chromebook at an amazing price then this is the Chromebook for you. It comes with enough memory and storage for most users and is also capable of running Android Apps. The NanoEdge technology means you get a 14-inch display in a small compact unit and the Type-C ports provide great future-proof connectivity. The only real negative is that it would have been nice to see a 1,080p display. However, when you consider the price of this Chromebook this is no deal breaker. This is a great Chromebook for anyone wanting to use a Chromebook on the move and is ideal for professionals and students alike. Definitely one of the best budget Chromebooks available and the price tag for what you get is impressive.